A brand-new games industry event is coming to the UK this year. Just days away, Interactive Futureswill bring games, culture and creativity to Leamington Spa. It's taking place at the Royal Spa Centre from January 31st to February 2nd. With an academic conference alongside its stages and workshops, and key speakers including Jo Twist OBE from UKIE and contributors from Rare, Ubisoft, Sega and more, it’s already looking like a must-visit destination for insight into the industry. There's a discount code for PocketGamer.biz readers too: PGIF20. Why would people from outside the region want to come and participate here? Leamington Spa is home to one of the UK’s largest games clusters outside of London. Major household-name releases are made there, and it has a strong indie scene. We caught up with a number of the local organisers to quiz them on the state of the region and their expectations for the event. Suzee Laxton (Strategic Economic Development Officer, Warwick District Council), Harinder Sangha (Operations Director, Sega Hardlight) and Sim Lee (Inward Investment Officer, Warwickshire County Council) shared their insight into the value of Interactive Futures. Launching a new event: Jordan Erica Webber the conference host, Nick Harper from Exient Games, Nick Duncombe from Playground Games and Alex Darby from Darbotron. PocketGamer.biz: What makes the event special and distinct from other events? Suzee Laxton: I think that what makes this event so special is its authentic and organic nature. It’s not-for-profit and has been driven by the people in the local studios to ensure that the content is current, relevant and that the whole event reflects the values and successes of Silicon Spa. Any additional income generated will go back into supporting the sector. It’s been a clear objective for the whole team that the event be accessible and inclusive in a wider sense than you’d typically see those words. The event is affordable so that smaller studios with tighter budgets are still able to attend, there is a strong representation of women, there is unheard-of collaboration between academia, industry and the talent of the future. Harinder Sangha: We love to think that video game professionals from the same area who may have never met before will be able to do so in a constructive environment. Local players of all ages will finally be able to attend a video games conference for the first time, meet developers, and eventually realise that some of the games they’ve played and loved have been created here, by people who may live just two doors down from their own place. The event isn't just about games: also "culture" and "creativity". What do these words mean to you? Laxton: Good question! In some respects, I think the inclusion of culture and creativity is less about what they are and more about how they interact with games. So many still assume the world of video games exists in isolation and its sole purpose is to provide entertainment. Actually, it’s far wider and is intermingled with so many other disciplines that it needs considering in the round. Please talk us through which big companies are on board. Laxton: Codemasters, Playground Games, Sega Hardlight and Ubisoft are all Associate Partners on the event. Having these major studios backing the event in its inaugural year really shows the strength of the games cluster in and around Leamington Spa. Across the event we also have speakers from companies including PlayStation, Jagex, Lucid Games, Special Effect, UKIE, Midoki and more, as well as Jordan Erica Webber (The Guardian and The Gadget Show) hosting the Main Stage throughout the weekend. What are the big global games industry trends in 2019 from your perspective, and how will they be addressed at Interactive Futures? Sangha: Video games are everywhere; from the palm of your hand to virtual worlds and, of course, PC and consoles. It’s not just about big companies either; indie studios also have more chances to get noticed these days. More than ever, the people behind these games and the experiences these games offer are more important than the platform. It’s how you tell stories and offer unique experiences that count. This is what Interactive Futures is about; video game experiences and their creators. What's the local Warwickshire region's big challenge for the year ahead? Sim Lee: I’d say the biggest challenge over the next year is creating more space and attracting talent. Leamington is already home to so many amazing studios and many people don’t realise that their favourite game has been made on their doorstep. We’re very fortunate that Leamington is such a beautiful town and that combined with the talent that’s already here, lovely studio space available and planned, and easy commute from London, is a great position to be in. Laxton: Keeping up with growth! It’s a lucky position to be in but the challenge is the rapid and significant growth that a number of local studios are experiencing. It’s not an easy challenge to overcome but we’re confident that we can make sufficient progress with this because, not wanting to sounds too cheesy, there’s a clear and common goal backed up with a huge amount of collaboration between various local parties. Sangha: Games are created by all manner of local developers, and all of them have the opportunity for their games to resonate across the planet. There aren’t many places where a relatively small geographic area is hosting so many talented video game studios and developers. “Think global, act local” has never been more relevant. How strong is the local indie scene in the area? Lee: The indie scene in Leamington is really strong. There are over 80 registered companies in Silicon Spa and a large proportion of these are indies. We’re really proud of our indie scene here and its continued growth is one of our main priorities. Laxton: Yes, we’re keen for the event to be a conversation starter, to encourage new collaborations and offer the opportunity to meet key industry players. As well as the Showcase space at the centre of the event there will be chill out areas, meeting spaces and I’m sure there’ll be plenty of chance for some post-event drinks too! Leamington has countless lovely pubs and bars that we’ll be directing people to once the day’s sessions are over. What will people be able to see in the expo area? Laxton: The Showcase area of the event will be brought to life by our wonderful partners and exhibitors. From the latest releases from Playground Games and Ubisoft (both of whom had releases in the top 10 selling games of 2018), to meeting the area's indie developers. It’ll be a vibrant and exciting hub for networking, discovery and building connections. There's a consumer element to the event too. Why is it important to you to have a b2c event as well as the b2b conference? 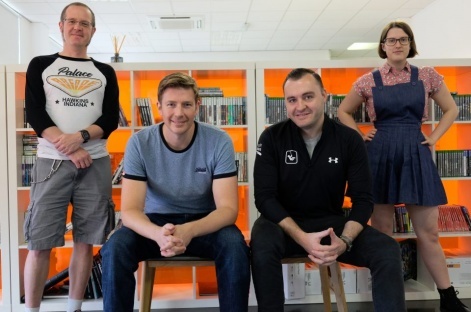 Laxton: Our studios in Leamington Spa are very committed to encouraging and nurturing the next generation of talent coming into the games industry and the consumer element to the event will allow them to meet some of those looking to launch a career in the sector. Additionally, Leamington Spa is a wonderfully vibrant town and it was important to ensure that the event is accessible to families and the general public too. We’re very proud of the success of the games cluster in the area and want everyone to feel a part of it. If you had one piece of advice for studios planning to attend Interactive Futures for the first time, what would it be? Sangha: Come as you are; we’re not here just to promote our studios and games. We’re here to show you what a special community we have in Leamington Spa. We’d like to share information with other local video game professionals and video game enthusiasts; to let players know more about the video games industry and the people behind these games. Gather your most enthusiastic team members and get ready to share! Our own Sophia Drake will be speaking at Interactive Futures about how to raise the profile of your indie games, so do check that out if you're in the areas. Our exclusive discount code PGIF20 will offer a big discount to the ticket price for the first 150 of our readers to apply. See you there!